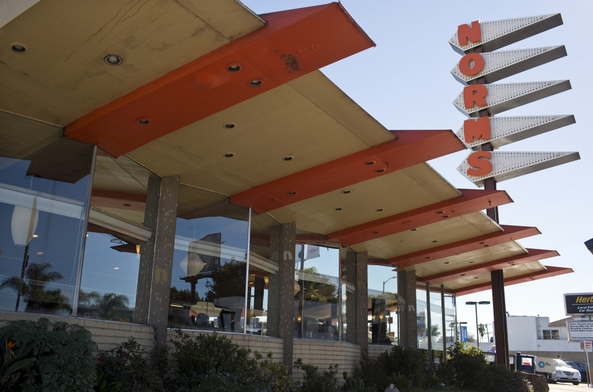 Norms restaurant at 470-478 N. La Cienega Blvd. The L.A. Culture Heritage Commission decision means the building cannot be demolished while it moves through the process of being nominated for a historic / cultural monument designation. That process could take several months, and the final decision is up to the Los Angeles City Council. The eccentric Googie style takes its name from a coffee shop called Googie that was at the intersection of Sunset and Crescent Heights boulevards in the 1950s. Today, in addition to Norms, a major example of the Googie style is Mel’s Diner at 8585 Sunset Blvd. just west of Londonderry Place in West Hollywood. More information about the situation and Norms cultural significance is available on Alison Martino’s Vintage Los Angeles Facebook page. Nothing is like Norms! 🙁 They are the best! I ALWAYS go to Norm’s when I visit Los Angeles. Great food and a fun time ! This is cautious good news. I appeal to the new owner and his architects to come up with a way to save the existing Norm’s building. Perhaps there is a way to build on or above the surface parking or find a good adaptive reuse of the building.